One of the University community’s most recognized citizens dies at age 72. 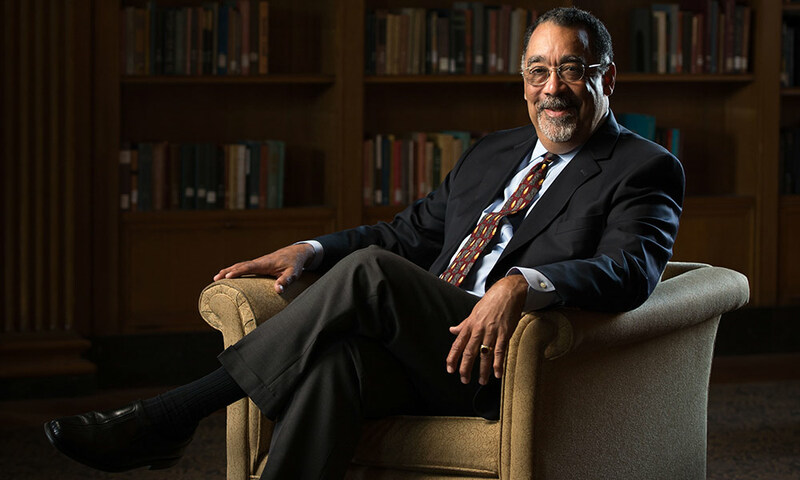 Paul Burgett—musician, scholar, teacher, and University leader for over half a century— has died after a brief illness. He was 72. Burgett, who arrived at the University’s Eastman School of Music in 1964 from St. Louis as a first-year student, became one of Rochester’s most prominent and beloved figures. During a University career that spanned 54 years, he served in an extraordinary number of key roles: student body president at Eastman, faculty member in the Department of Music, dean of students at Eastman and for the University, advisor to four University presidents, a University vice president, and general secretary to the University’s Board of Trustees. Along the way, he steeped himself in the history of the University, becoming the leading storyteller of the institution. To generations of students, alumni, parents, and friends, he was the face of Rochester. Known almost universally as Dean Burgett, he was widely admired for his rapport with students and community constituencies, his unabashed affection for the University and the influence the institution and its people had on his own life, and for his unflagging commitment to holding Rochester and the members of its community to the ideals of its motto, Meliora. University President Richard Feldman, who worked often with Burgett on academic and administrative initiatives, said Burgett had been enormously influential in helping shape the University as an outward-looking, community-oriented, multicultural institution, where students and faculty were expected to learn from one another and to value the perspectives and experiences of others. “Anyone who worked with Paul was deeply impressed by his commitment to each and every individual in our community,” said Feldman. “While he had a masterful grasp of the institution, its place in higher education, and its history, he remembered almost every student he ever met by name. The eldest of six children born to an African-American father and an Italian-American mother who had to cross the border into Illinois in order to be married, Burgett grew up in 1950s Missouri, knowing that he and his family were different. “We didn’t have the word ‘biracial’ back then,” he told Rochester Review in a 2015 profile, and he acknowledged that “the veil,” which W.E.B. Dubois described in The Souls of Black Folk, also described how he and his siblings would be looked at by many white Americans, and was never wholly lifted. Supported by his musician parents (his mother an organist, his father a concert baritone), Burgett earned recognition as a young violinist, coming to the attention of family friend Edward Ormond, then a violist with the St. Louis Symphony. Burgett auditioned for Eastman while in St. Louis and began his studies in the fall of 1964 as a member of the Class of 1968. In April 1968, when Martin Luther King was assassinated, then senior Burgett was asked to address a convocation held in Kilbourn Hall to memorialize King. “It is quite clear that Dr. King recognized the social ills of this nation—ills which were manifest through the convenient tools of racial injustice,” Burgett said in his remarks. “But ills which in fact lay much deeper than that. After graduating in 1968, Burgett was offered a fellowship to work on his doctorate but postponed his studies to join the US Army Reserves, where he played the tuba in a military band. He returned to his studies at Eastman after serving as executive director of the Hochstein School of Music and Drama. He taught music half-time in the Greece Central School District while he earned his Ph.D., and became an associate professor of music at Nazareth College of Rochester after graduation. Advocating for the history and creativity of black classical musicians and composers was never far from Burgett’s heart. He championed the Gateways Music Festival, a multiday series of concerts, performances, and other events designed to provide classical musicians of African descent a performance showcase of their own. The biennial festival was brought by an Eastman faculty member to Rochester in 1995. Burgett helped nurture and strengthen its ties to the Eastman School of Music; at the time of his death he was chair of the Gateways Board of Directors. Burgett was named dean of students at Eastman in 1981 and drew on his own experience to improve student programs, including planning for Eastman’s Student Living Center. At Eastman, he first began giving his signature presentation, now known as “The Fiery Furnace.” In the address, which he continued to present to first-year students and was scheduled to deliver again this fall, he describes a University education as a journey that students embark on, one in which they will have to confront ideas and perspectives, challenges and opportunities that will mold their character. Education is, he noted, much like a furnace, a prospect that can seem terrifying. In the speech, he articulated what became something of a mantra as he helped students find their path in life. “Passion and ability drive ambition,” he often said, noting that picking a major is not nearly as important as caring deeply about a topic so much that you tap into and develop your abilities to find success. After seven years at Eastman, he was named University dean of students, a move that established his home base at Wilson Commons on the River Campus but allowed him to keep a hand in the life of his beloved Eastman School. As dean of students, Burgett often described his role as gaining access to the “backstage” of students’ lives, getting to know them in ways that allowed him, student services staff, and other faculty to offer better support and advice to orient cocurricular programs to better correspond to the needs of students. His gregarious personality and deft ability to read the emotions of others made him particularly successful at advising students. In a nod to his own upbringing, in which his father and mother encouraged his ambitions as a musician and educator, Burgett often referred to the students he got to know as “Doctor” in reference to their aspirations as scholars and professionals. As University dean of students, he’s credited by peers and students alike with improving programs at Wilson Commons, University Health Service, the University Counseling Center, Residential Life, Interfaith Chapel, Athletics and Recreation, and several other programs. In 2001, Burgett became University vice president, general secretary to the Board of Trustees, and senior advisor to the president. In these roles, he worked closely with Presidents Thomas Jackson and Joel Seligman. He stepped down as general secretary in 2011, and continued to serve as vice president and presidential advisor. Burgett took on a high-profile assignment in 2015, when he and Feldman, then the dean of the College, co-chaired the President’s Commission on Race and Diversity. The 20-member, University-wide committee recommended ways to improve Rochester’s programs for increasing diversity among students, faculty, and staff, and for creating a campus environment that values diversity in its many forms. In 2015, Eastman awarded Burgett a Distinguished Alumni Award and asked him to address the graduating class. Throughout his tenure, he regularly taught two popular undergraduate classes— Music of Black Americans and History of Jazz — as a faculty member in the Department of Music in the School of Arts & Sciences. In a 2010 Rochester Review article titled “101 Things to Do Before You Graduate,” writer Dana Hilfinger ’10 cited Burgett’s History of Jazz class as No. 12. Located in Douglass Commons as part of the building’s renovation into a student-focused campus hub, the center brings students together to work with and learn from those from other cultures, backgrounds, beliefs, socioeconomic statuses, sexual orientations, and perspectives. As a resident of the Greater Rochester community, Burgett also threw himself into community service in the region. He served such groups as the Urban League, the Hochstein School, the Genesee Country Museum and Village, the Rochester Arts and Cultural Council, the United Way of Rochester, the George Eastman Museum, and many others. He was also a leading force behind the University’s support for the Rochester Fringe Festival when the multiday performing arts festival was launched in 2012. Many of the performers for the festival have University connections and many of the events are staged at Eastman venues. At the University, he co-chaired the faculty and staff component of the Meliora Challenge, Rochester’s historic $1 billion fundraising campaign. “Now in the twilight of my professional career, I have become fascinated by the story of the University that educated and trained me; sent me out into the world as a well-prepared and confident high school and college music teacher, performer, and music administrator; and then welcomed me back 34 years ago and turned me loose on its campuses and in its halls and classrooms to join the faculty, students, and staff in the work of its auspicious and noble mission. The transformations that took place during Burgett’s history at Rochester sometimes took even him by surprise. In the 2015 profile for Rochester Review, he said that he found it hard to believe that he had been at Rochester for 50 years. “That’s not been relevant to me,” he said. “Because I hang around students who never age, do they? They’re always 18 to their mid-20s or so, some a little older. And when they get to the end of their studies, they leave and are replaced by newcomers. There will be a private memorial service and a celebration of Paul’s life at a later date. 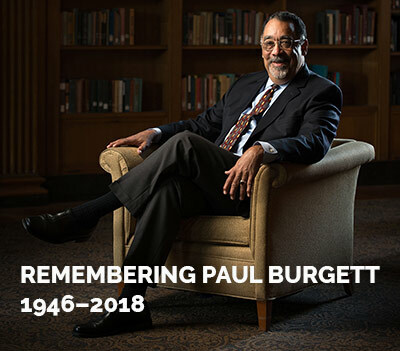 Messages of condolence to be shared with Paul Burgett’s family can be sent to his friend and longtime assistant at the University, Kim Truebger, by email to kim.truebger@rochester.edu or in hard copy to Box 270011, University of Rochester, Rochester 14627-0011. Remembrances can also be shared on a special memorial website: www.rochester.edu/news/remembering-paul-burgett.